Knitting - some people make it look so easy! My grannie used to knit all the time. She used to make us grandchildren embarrassing home-knitted jerseys, which I did not appreciate at the time, but when I was a little older I actually asked her to knit one for me because the house I was living in while attending uni in Palmerston North was absolutely freezing! My mum also used to knit occasionally, I do remember that she spent hours knitting mittens for me and a smaller pair for my little brother in preparation for a trip to the snow. On the first day up the mountain both pairs got saturated and were hung to dry in the drying room at the lodge. The next day my pair fitted my brother and his pair would have fitted a baby, oops! At some stage my grannie taught me to knit too. I can't remember actually finishing a knitting project at the time. I've only been blogging since last Nov, I thought it would be fun to record things that we do, but in the process I've discovered some really interesting and inspirational blogs as well, and that's really turned out to be the best part. So I'm especially honoured that someone else has discovered MY blog and given me the Liebster blog award. This award seems to have been circulating the blogging world for a while, I supposed its a bit of a chain letter, but I think its a fun opportunity to tell you about some of the blogs that I enjoy. I was excited by the idea of making soap using our cows milk. I thought that was another great self-sufficient product that we could add to the list. I bought a book about making milk soap and I read it. I was so very DISAPPOINTED to find out that milk would be a minor ingredient in the soap. I would still need to use a fat or oil and lye. Well, I don't regularly produce any fats or oils here, so it wouldn't be very self-sufficient to buy fats or oils (not to mention the lye) in order to make soap. 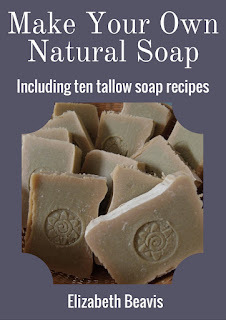 Having found out the realities of soap making, I decided that I'd rather just buy nice soap from someone and support a local business, than fuss about making my own, so we get our soap from the farmers market at the moment. I keep forgetting to take photos at milking time because its usually still dark, but we slept in a little the other day, so I was able to take a few photos so that I can explain the process. Following on from my post from the other day about raw milk, a friend who works in the food regulation area sent me some great links from NZ. Firstly, NZ takes a risk management approach and allows farmers to sell up to 5L of milk directly to customers for their personal consumption. This is a very sensible approach that allows farmers and consumers to get what they want, raw milk direct to customers, without unnecessary regulation. Getting a calf started on the bottle is not easy. At first they are scared and miss their mum, so they don't cooperate at all. When little Trevor first came home with us he was only a few weeks old. We struggled with him for days, my husband standing over him to hold his head still and me trying to get the teat in Trevor's mouth. Eventually he worked it out and we were greeted each morning at sunrise with hungry mooing as he paced up and down his pen waiting impatiently for his bottle. Those days when he wouldn't feed were very stressful though, we didn't know if he would die of hunger and we were seriously considering loading him back in the ute and taking him back to his mum! Molly was exactly the same, but after a few days, just like Trevor, she got hungry enough to work out what we were trying to do and then she was waiting for her bottle after milking morning and evening and finishes it with no trouble. 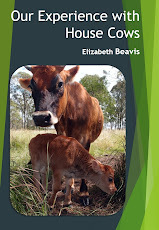 On Friday the 5th of August my husband and I left Nanango at 6:15am headed for Beerwah (Sunshine Coast) to attend a workshop with Joel Salatin of Polyface farm, he's a written a few books too. I didin't know much about Joel before we booked the workshop. I had heard of him because Emma has mentioned Polyface a few times in comments and he also wrote the forward to "The Raw Milk Revolution", which I read recently. When I heard about the workshop (from the South Burnett Permaculture Group) my husband and I checked out a few of his videos on Youtube and thought he seemed like a pretty good presenter, so it would be worth the effort to get there. Feeding time - what's in that bucket? Each morning and afternoon we walk around our property with white buckets of animal feed. Some animals are happy to eat their own feed, but others wonder what is in the other buckets, this can make life difficult when walking past Bella with a bucket of chicken food!